Exchange Server 2016 communicates with clients, applications and other servers over a variety of network protocols such as HTTPS, SMTP, IMAP and POP. Much of this communication, particularly clients and applications, involves username and password-based authentication. When user credentials are sent over the network they are sent “in the clear”, meaning they can potentially be intercepted and read by an attacker. Other information transmitted during the session may also be sensitive and prone to abuse if interception was possible. When Exchange Server 2016 is first installed it generates a self-signed SSL certificate that is then enabled for IIS (HTTPS services like OWA, EWS and ActiveSync), SMTP, POP and IMAP. The self-signed certificate allows the server to be “secure by default” and begin encrypting network communications right from the start, but it is only intended to be used temporarily while you provision the correct SSL certificates for your environment. If you're tempted to stick with the self-signed certificate, or to try and disable SSL requirements on Exchange services, I strongly recommend you do not do those things. There are three basic requirements for an SSL certificate in an Exchange Server 2016 deployment. Certificate validity period – each SSL certificate has a fixed period of time during which it can be considered valid. When the SSL certificate reaches its expiry date it will need to be renewed to continue working. Trusted certificate authority – clients will only trust SSL certificates that have been issued by a certificate authority that they already trust. This is one reason that the self-signed certificate is not suitable for general production use, because your clients will not trust certificates issued by the Exchange server itself. There are a wide range of certificate authorities available to purchase certificates from that your client operating systems and devices will trust. I generally recommend using Digicert. Choosing a certificate authority is simple enough, and the validity period will be determined by how long you purchase the certificate for (usually a minimum of 12 months, but the longer the validity period the less the certificate tends to cost per year). That leaves the server/domain names (or namespaces) as the main decision point when planning your SSL certificates. In addition to the HTTPS namespace it is also common to use a separate namespace for each of the SMTP, POP and IMAP services, although it is certainly not required to do so. There is also the Autodiscover CNAME to consider, and the root domain as well. The recommended practice is to only include aliases as namespaces on SSL certificates, and not any server fully-qualified domain names (real server names). Due to recent changes to certificate issuance rules you may also find it impossible to request an SSL certificate for a domain name that is not internet-routable or that you do not legitimately own (e.g., domain.local). If you're unsure about how exactly this will work please read my article on avoiding server names in SSL certificates. Which Type of Certificate to Purchase? 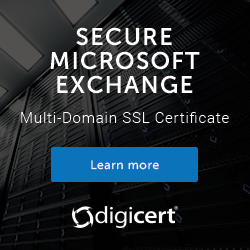 Certificate authorities such as Digicert can sell you a variety of certificate types, and some certificate authorities have different names for what is basically the same thing. A standard SSL certificate contains a single name and is generally the cheapest to purchase, however these are not suitable for even the simplest of namespace designs. A wildcard SSL certificate allows you to secure multiple names on a domain without having to specify the exact names on the certificate itself. For example, a Digicert wildcard certificate can be acquired for exchange2016demo.com and *.exchange2016demo.com. While these are often a lower cost option, wildcard certificates can have compatibility issues with some integration scenarios with other systems, as well as not being suitable for secure POP and IMAP configurations. A SAN or UC (Unified Communications) certificate is the recommended type of SSL certificate to purchase. A SAN certificate can contain multiple names. For example, a Digicert UC certificate can include up to four names at the normal price, with additional names up to 25 total being available at an additional cost. While the cost of a SAN/UC certificate will be more than a wildcard certificate you are less likely to run into any compatibility issues with the SAN/UC certificate, as long as the certificate contains the correct names. If you make an error with your namespace planning or need to add a name later Digicert and some other providers will allow you to re-issue the certificate at no cost, while other providers will charge a re-issuing fee. How Many SSL Certificates Should You Purchase? After planning your namespaces and choosing a certificate authority you may be considering how many SSL certificates to purchase, especially if you have more than one Exchange 2016 server. The recommend practice is to provision as few SSL certificates as possible, because it is simpler to administer as well as less costly to purchase. So while it is possible to have separate certificates for each of the HTTPS, SMTP, POP and IMAP services, it is recommended to use one certificate for all of them unless you have a specific scenario that requires different certificates. Note that while only one SSL certificate can be enabled for HTTPS on a server, multiple SSL certificates can be enabled for SMTP. However in most simple deployments only a single certificate will be required for SMTP. Similarly it is recommended to use the same SSL certificate for all of the Exchange servers that will be configured with the same namespaces. For example, if you have two Exchange 2016 servers in a site that will be load-balanced, and both have the “mail.exchange2016demo.com” namespace configured for HTTPS services, they should have the same certificate installed. You achieve this by provisioning the certificate on the first server, and then exporting it and importing it to as many additional servers as needed. Very good article. In essence this is the same as 2010/2013 so the process is the same for 2016. If it isn’t broken then it doesn’t need fixing. Why are they not suitable? We successfully deploy Exchange servers with a single mail.domain.com certificate servers using a SVR record for autodiscover. The only client that has any difference in response to this is Outlook, which will prompt to confirm the redirection of autodiscover.domain.com to mail.domain.com, to which you select ‘Allow’ and tick the ‘Always Allow’ box and you never see it again. Android and iPhone just accept the redirection automatically (its transparent). Granted in larger organisations with lots of clients this may make setting up clients more trouble than the cost of SAN or wildcard SSL, however in small business its a no brainer (SAN/Wildcards are expensive). There may however be a group policy that can be created to accept the redirection automatically (not sure though on that one, we have never needed it). Because for maximum compatibility across clients, devices, mobile apps, external testing tools, load balancers, etc etc etc, I recommend SAN certificates. I’m not going to recommend “Use a single named cert” when it comes with a list of known caveats and unknown potential problems in the wide variety of environments that people reading this blog post might have. I’ve heard it both ways so I’m leaving it in until the RTM release confirms it one way or the other. Can you add to this article that MS does not support SHA1 certificates in Exchange 2016? Ran into this today. Reused a wildcard cert from an Exchange 2010 and it came up as invalid in Exchange 2016. I am currently planning to migrate from 2010 to 2016. Will my 3rd party cert exported from 2010 work if i Import it onto my 2016 servers? Check whether it is a SHA1 cert or not. If it is, talk to your certificate provider about getting it reissued as SHA2 before you use it with Exchange 2016. I could not locate Microsoft’s requirements for secure SMTP and POP service associations to be not supporting wild card certs. Could you please explain a bit more or break down on why the wild card certs are not a good choice for secure SMTP and POP service associations ? You can use wildcards for both SMTP and POP. My company currently has a 2010 exchange server. I recently installed a 2016 exchange server. I tried to install the SSL certificate as per your instruction. Under ECP-Servers there is no “certificates” option?? Am I looking in the wrong place? There’s a screenshot in this post showing where to find it. Our company has on-premised Exchange 2016 with FQDN/Namespace for mail.domain.com and we have around 7 accepted domains configured as authoritative. What is your recommended type of SSL for our exchange? As we prefer for Symantec SSL, can we go for Symantec Secure Site with EV only or Pro or Pro EV? Do 7 authoritative accepted domains needs separate SSL or this will be also secured by 1 single SSL cert for our mail.domain.com? Highly appreciate your input. Thanks so much! You can have one SSL certificate bound to IIS for handling HTTPS client traffic, so it must be valid for all of the HTTPS namespaces configured on your server. So it depends whether you’re using all those domains for HTTPS (e.g. autodiscover) or just the one mail domain for HTTPS. You can have multiple SSL certificates bound to SMTP for TLS encrypted SMTP connections, if you need multiple namespaces to work for SMTP services. If I have an all internal exchange setup for lab, can I install the Active Directory Certificate Services instead of using Digicert? Will everything work (internally of course) if I choose this approach? If it is a lab, sure thing. I’ve done that quite a few times myself. Works fine, for internal domain-joined clients that trust the issuing CA. You can also look into using a Lets Encrypt certificate if you’d rather not run a CA. Ah nice. Thanks for a fast reply! Regarding the certificate, in your example above, what CN’s do you put in the certificate? Just mail.exchange2016demo.com or do you include something more? I am looking for a certificate for a site that has only one Exchange server. We’re looking to have it for external mail use and mail on IOS and Android. Which certificate would you recommend better. Hi Moana, my recommendations are in the article above. Couldo you please help me? i have an exchange server 2013, with a valid certificate, but is about to expire. I need to renew my Wildcard certificate, can someone please help me hpw to renew a wilcard certificate in exchange 2013. We have server 2013 & 2016. In both, we have implemented SSL certificate. Still, logs say the password is going to clear text. So I have read somewhere it may be implemented partially not fully. So, I want to know how it can be implemented partially not for the full site? Which logs say that, and what exactly do they say? There are lots of different logs on an Exchange server. You’ll need to be more specific. 1. This thing is only for Exchange 2016 or can use on 2010/2013? 2. When I install EV SSL on my IIS (included mail.domain.com, autodiscover.domain..com and owa.domain.com), and OV SSL for other services such as IMAP, POP, are there any issue? Which SSL certificate is suitable for exchange 2016? Can I use Standard SSL? I have set up a Exchange 2016 test server using a LetEncrypt certificate. This has been enabled in Exchange for SMTP, IMAP, POP & IIS. Can I now safely remove the self signed certificated generated when I installed Exchange? Or is this a bad idea? I am configure Digicert SSL Multi domain Public SSL in exchnage server 2016 & it’s success fully install but when send a email to outside domain like gmail & others showing did not encrypt this message in massage . Note that previously install on the server exchange self sign & rapidssl public SSL . anyone can me help about tls encrypt massage during email communication.